In this episode, I talk about the role of leadership in digital transformation. Facebook updates the News Feed algorithm, is this the end of organic reach? Many marketers just like me weren’t so surprised with the implications of what he said, because organic reach has been reducing like the 2008 economic crash for quite a while. I’ve been saying for 18 months that “we need to pay to play on Facebook” but it seems we may now need to pay all the way for results. So, what does it mean for Page Admins? It’s time to review your content marketing plan in its entirety. Set aside a budget for Facebook ads and start developing your Facebook advertising strategy. Think about your online marketing from your customer’s perspective, not your sales perspective. Listen to the experts (and make sure it’s an expert you are listening to). Facebook is one channel but should not be your entire marketing strategy – eggs and baskets come to mind! Facebook has announced new partnerships to enable sharing of music content with Universal and Sony, which will be added as part of Facebook’s new ‘Sound Collection’ audio library. The move will allow Facebook publishers to share more engaging create video content using popular music and other favourite genres. They’ve also announced a deal with Global Music Rights, which represents a range of popular artists including Pharrell Williams, Bruno Mars, Drake and Bruce Springsteen. This is great news for publishers as we can now add music to our videos and other content without infringing copyright, and subsequently having our posts taken down. Google has announced the merger of all of its different payment services to create Google Pay. Android users may already be familiar with Android Pay and Google Wallet. With the new system, payment information saved in your Google account will be available everywhere you use Google products: in Chrome for web purchases, in YouTube for renewing your subscriptions, in apps on Android for in-app purchases, and at retail outlets with NFC (near field communication) payments. According to Google, apps like Airbnb, already support Google Pay, with more sites and stores set roll out soon over the coming weeks. In this episode, I interview Paul Prior, Managing Director of FTI Consulting. I met Paul at Pendulum Summit in Dublin where Richard Branson was speaking. Paul and I took the opportunity to have a side-line conversation about digital transformation and the role of leadership in this process. Pendulum Summit is a major personal development event hosted by Frankie and Norma Sheahan. Paul is a senior executive with more than a decade of experience in defining, leading and executing sustainable business performance improvement for global corporations. He has extensive experience in strategy formation and accelerated execution in innovation, digital, analytics, regulation and operating excellence and has worked in Ireland, the UK, the USA, South Africa and Canada. In this episode, I’m giving shoutouts to three organisations that have embraced digital transformation with gusto. According to Cisco, by 2020 there will be 50 billion internet-enabled devices which to create an interconnected ‘Internet of Things’. These devices already exist and include mobile phones, connected cars, home assistants and fitness trackers which let’s be honest, are now common-day but invaluable. One of the biggest challenges the Met Office has always faced is differentiating itself in a competitive market. Recent growth in new technology – an explosion of mobile apps, APIs, and even voice search – means data around weather has become much more accessible. In the face of stiff competition, the Met Office set out to achieve a point of difference, focusing much more heavily on its content marketing efforts through storytelling. One of the first steps was to determine exactly what everyday consumers want from the Met Office. Turning to analytics, it soon found that the answer is not simply data, but as Simon describes it, the “what, the why, the where, the when” that surrounds it. Video is an effective tool for the Met Office and along with its mobile app it helps to differentiate itself from competitors. This is a very real issue for public sector organisations that find themselves competing with YouTubers and bloggers. The app provides users with an updated weather forecast four times a day, and includes other innovative features like an interactive rain fall map and pollen push notifications. The Met Office also optimises content based on different audience demographics, pushing out tailored infographics, videos, and blogs geared to people interested in seasonal or timely events, such as Glastonbury Festival or the pollen season. This transformation involved the digital marketing team working closely with everyone from scientists and forecasters to the observation and graphics departments. For example, if the core digital team is able to determine that a specific area of content works well on social – let’s say satellite imagery, for instance – it is able to feed this back to the satellite team to help them better understand the type of information they should be sharing. One of Ireland’s flagship banks, Bank of Ireland wanted to develop a retail experience on the campus of Dublin City University that would scale. The Bank wanted to deploy interactive services and digital signage into its Dublin City University branch to engage more effectively with first-time account holders and give them a better customer experience. BT worked with its partners to deliver a rich multimedia experience with interactive digital services that would stand out from the crowd in the competitive student banking market. It’s a new kind of retail banking. From the moment students interact with the screens, they engage with the bank in a way that can be measured and used to continually improve their customer experience. 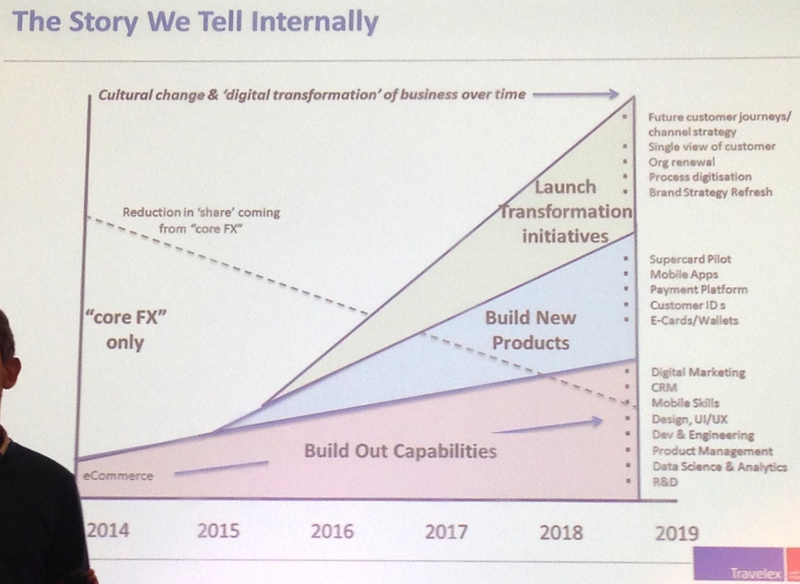 Foreign Exchange company Travelex’s approach to digital transformation is what I want to share from their experience. They believe that you can’t outsource what is core and strategic, and new capabilities lead to new products that become growth engines over time. Emphasise the long game while racking up quick wins. Talk about speed, agility, failure, new capabilities, ways of working and collaboration like it’s going out of fashion. Avoid the cool kids in the corner syndrome. It’s both horizontal and vertical. Avoid creating a digital silo – integration and engagement are critical. ‘Broken windows’ – dress code, office decor, Macs instead of PCs, seating plan. Huge internal focus on ways of working. Placed digital and the customer at the heart of our business strategy. Customer centric, data driven, tech-enabled mentality. Greater tolerance of failure and ‘test, learn, iterate’. What they learned along the journey? The things which will surprise you are not what you expect. People are excited and want to help… collaboration is key. Excitement and momentum are key. The hard thing is keeping the energy up in the in-between years. You have to tell two stories internally. Digital has to be made relevant to every team. This week I gave a presentation to a Board of Directors on their role in Digital Transformation and here is one question that emerged from that meeting. I’ve chosen this question because it is one that I am asked frequently by decision-makers who openly admit that digital and technology is not their area of expertise. The answer is no. I always appeal to organisations to look at their existing staff and their skillset. In this case it was a radio station. A company full of talented, content creators, skilled journalists and reporters, experienced in communicating the facts and representing the brand of that organisation. In today’s JSB column, I want to share my thoughts on why digital transformation starts with decision-makers. I am currently writing my book on Digital Transformation in the Public Sector with a focus on communications. So, looking at all aspects of digital comms – PR, social media, traditional marketing and campaigns, reputation management, policy communications, event management and digital marketing. I’ve been working with organisations of every size for the past 10 years on their communications strategies but things have changed and are changing very fast. If you fail to embrace digital this year with a comprehensive strategy and a roadmap to achieve your objectives, you will be yet another year behind the curve. You have to be best in class when it comes to digital. You have to be wholly customer-centric and that means having a mobile-first mindset, tracking the journey of your customer and giving them the content they are searching for online. Let’s have a look at some figures which tell a story in themselves. 56% of executives believe that a lack of digital leadership to define a clear and concise strategy is one of the key barriers when it comes to delivering an improved customer experience through digital transformation. In other words, many companies report they are undergoing digital transformation even though most don’t know how to go about it. Here are my seven steps when approaching a digital transformation project with a client. Remember my transformation projects focus exclusively on transforming traditional marketing, PR or communications teams into digitally agile departments. If you would like help with developing your digital transformation strategy get in touch! Simply drop me an email to joanne@digitaltraining.ie. The tool that saved my working week is Zapier. Everyone who knows JSB knows that I like to be organised and I love to plan. That’s why Zapier has been a welcome introduction into my life. Zapier allows you to moves between your web apps automatically, so you can focus on your most important work. Zapier is the glue that connects more than 750 web apps. Zaps are Workflows that connect your apps, so they can work together. Zaps Start with a Trigger—an event in one of your apps that kicks off your workflow. Zaps Automate Tasks in the background, so you can focus on more important work.